The brand new 718-generation Porsche Cayman has landed, hot on the heels of the 718 Boxster. It’s available to order now, with first deliveries due in autumn and priced at £39,878 for the standard car or £48,834 for the Cayman S.
That price is interesting because it reverses the previous Boxster-Cayman convention by making the Cayman the cheaper of the two – as per the 911 pricing strategy (and virtually every other convertible that's based on a fixed top production model.) It also means that the price uplift from the outgoing Cayman to this one is minuscule – just £184 in the case of the base model. The new pricing structure makes a Cayman around £1800 less than an equivalent Boxtser. As per the 718 Boxster, two cylinders have been dumped and a turbocharger added, meaning both the standard model and the more powerful S are powered by four-cylinder turbo engines – a 2.0-litre in the former and a 2.5-litre in the latter. But before you reach for your cognitive fanboy rage button, remember that Porsche was winning races with mid-engined sports cars powered by four-cylinder turbo engines in the ‘50s and ‘60s. Back to today, the new Cayman is both quicker and more efficient than before, with the 2.0-litre, 300PS standard car returning 40.9mpg with a six-speed manual gearbox, up from 34.9mpg in the old six-cylinder Cayman. 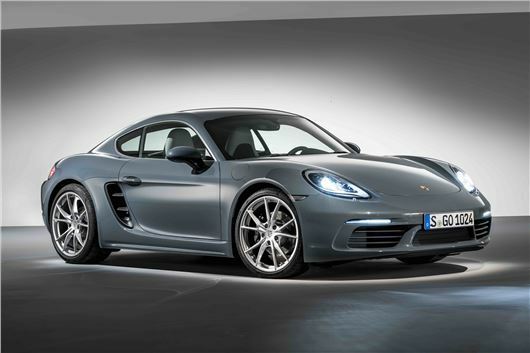 The same model now takes just 4.7 seconds to hit 62mph with a seven-speed PDK automatic gearbox fitted, while the outgoing Cayman 2.7 took a positively tortoise-like 5.7. The Cayman S, with a 2.5-litre turbo engine packing 350PS, does away with 62mph in just 4.2 seconds, thanks largely to a 50Nm torque boost that takes peak to 420Nm from just 1900rom, while its top speed is 177mph – seven more than the standard car’s maximum. Porsche claims, of course, that the Cayman is more agile than ever thanks to a “comprehensively retuned chassis” including stiffer anti-roll bars, fettled dampers and a steering rack that’s ten per cent more direct. Buyers can specify a Sport Chrono Pack and an electronically adjustable rear limited slip differential to further boost dynamics, while adaptive damping (called Porsche Active Suspension Management) drops the ride height and allows the driver to change the suspension characteristics to suit. Stopping power is boosted in line with the performance leap, with the standard car borrowing the larger braking system from the outgoing S, while the new S takes its setup from the 911. As you can see, styling changes are minimal, with the 718 Cayman basically a very thoroughly facelifted version of the outgoing car. The interior architecture remains, albeit now including the latest version of Porsche’s multimedia interface, while outside changes are consigned to the details too – most notably the beautiful Porsche-branded stretch between the taillights.